The method of obtaining nanoclusters α-Fe2O3 in the pores of monodisperse spherical particles of mesoporous silica (mSiO2) by a single impregnation of the pores with a melt of crystalline hydrate of ferric nitrate and its subsequent thermal destruction has been proposed. Fe3O4 nanoclusters are synthesized from α-Fe2O3 in the pores by reducing in thermodynamically equilibrium conditions. Then particles containing Fe3O4 were annealed in oxygen for the conversion of Fe3O4 back to α-Fe2O3. In the result, the particles with the structure of the core-shell mSiO2/Fe3O4@mSiO2/α-Fe2O3 are obtained. 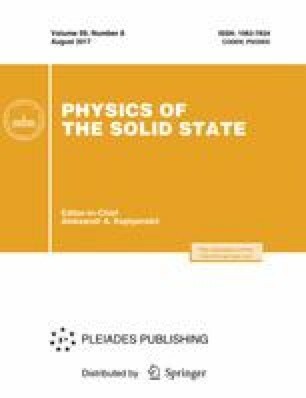 The composition and structure of synthesized materials as well as the field dependence of the magnetic moment on the magnetic field strength have been investigated. Original Russian Text © E.Yu. Stovpiaga, D.A. Eurov, D.A. Kurdyukov, A.N. Smirnov, M.A. Yagovkina, V.Yu. Grigorev, V.V. Romanov, D.R. Yakovlev, V.G. Golubev, 2017, published in Fizika Tverdogo Tela, 2017, Vol. 59, No. 8, pp. 1598–1603.